The 27th Andrea Margutti Trophy held in Lonato has been quite a rewarding race for CRG drivers, not only for the KZ2 victory scored by Pollini with Renda Motorsport, but also for the good performances of the three new works drivers Petecof, Serravalle and Chovet in OK Junior and for the growth of some interesting youngsters like Mallet, Camplese and Cecchi in 60 Mini. Giacomo Pollini, on CRG-Tm run by Renda Motorsport, has been excellent putting in a splendid weekend ended with the victory in final that has been particularly tight until the last lap. His successful overtaking move on Schmitz, when a few corners were left after a race run in the slipstream of the rival, deserved a round of applause. Pollini has been supported well by the CRG Road Rebel chassis, that allowed the young Italian to keep the lead until the chequered flag fending off his rival's reaction. 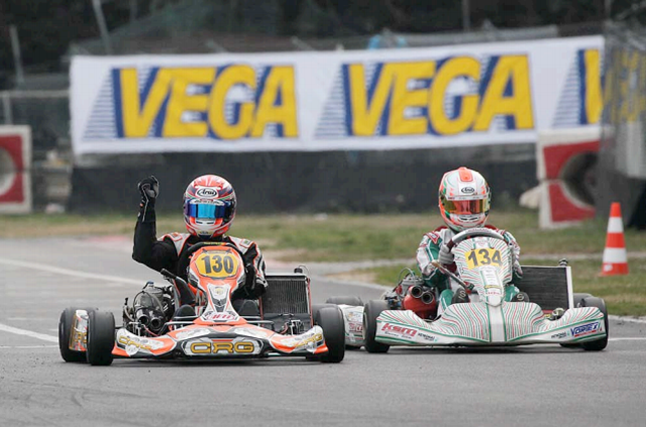 The Andrea Margutti Trophy has been a great chance to make three new drivers debut on CRG works team in OK Junior. The young Brazilian Gianluca Petecof, on CRG-Parilla, displayed great speed being fifth after heats, tenth in Prefinal and eighth in the Final, where he has always been close to the leading group. The Canadian driver Antonio Serravalle also put in a great race, ending 14th after a very good sixth place in Prefinal. The French Pierre Louis Chovet also had a positive debut showing great speed in practice. The penalty he was handed in Prefinal, due to the mis-positioning of the front fairing after a contact, forced the young French driver to start the Final from the back and was therefore slowed down in the melee of the race ending 30th. Gianluca Petecof and Antonio Serravalle will take part in the forthcoming WSK Super Master Series to be run next 20 March in Sarno, joining the other CRG drivers Teddy Wilson and Dennis Hauger. CRG colors have been shining also in 60 Mini, where the very young French of Gamoto Racing, Evann Mallet, has been chasing the victory ending second at the sprint to the line, after leading the Final for a long time. Federico Cecchi of team Morsicani took a great fourth place, after being third in Prefinal. The other Gamoto driver Riccardo Camplese put in an excellent comeback race ending sixth in a Final he started from the 21st spot of the grid.